My thoughts today circled around a passage in Genesis that for years has been an incentive for me, even before the age of bucket lists. 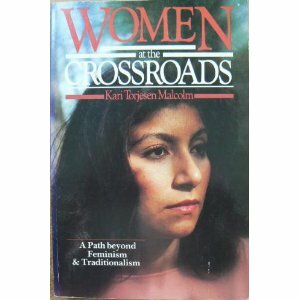 Over 20 years ago I was dealt a religious blow by Kari Torjesen Malcolm, author of Women at the Crossroads:Beyond Feminism and Traditionalism. From my earliest memories of faith I had been taught that essentially women, in the church, were to be seen and not heard. Being a child in the 60's and an adolescent turning adult in the 70's I was a girl/teen/woman looking ahead, living in a rapidly changing culture, while feeling the tug of the past to keep things the way they were, especially in the church. That period of time was significant in the life of the church - music was changing, preaching styles were evolving, Bible translations were multiplying and worship forms were being transformed. By the time I was in my mid-twenties I was reveling in the newness of what was happening along with being dizzy with questions. Published in the early '80's Ms. Malcolm's book opened a world of thought on the role of women in church and faith like I had never heard before. Then came the opportunity to hear her speak and I will never forget her turning to Genesis 1:27 So God created man in his own image, in the image of God he created him; male and female he created them. It was this verse that was the basis for Ms. Malcolm's premise that women were also created in the image of God and therefore we had as much responsibility as men to be witnesses, active participants in the Kingdom, out in the world proclaiming the Good News. Because we were the reflection of God's image we had more to do, more to live out than what the Christian culture had, up to that point, ingrained in us. Motherhood wasn't bad, indeed it was God's gift, but it wasn't the only responsibility that God was giving us, his created women. The majority of us in the room that day were straddling an ever widening cultural gap and we were needing to make a choice. Driving home that day I made a decision that radically changed my life. Years later, having waded through years of infertility I was thankful that on that eureka day I had decided to embrace my new reflection - created in God's image. When my husband and I had exhausted what "miracles" the doctors could perform and our finances could withstand we were still childless. It was at this juncture that I leaned into this passage from Genesis. My identity was not in being a mother. My identity, my image, was truly in the One who made me. Writing this now in the 21st century when women's roles have broadened and expanded, even in the church, my struggles back in 1985 seem ancient and perhaps unbelievable. But being assured that day that God had something for me to do that went beyond just staying at home raising children saved my life when I believed motherhood had been stolen from me. Years later I did become a mother of a delightful, beautiful 2 1/2 year old (now 20 years old) and I believe, or at least pray, that the words Ms. Malcolm spoke into my life helped me be a better mother. Bucket item: Live everyday believing that I am created in God's image and because of it I have important work to do in His Kingdom.